We are entering one of the dreaded weeks for people who work in education. As one colleague calls is “Nativity & Glitter Week”. The kids are on a high, nothing gets done, Joseph gets stage fright, a shepherd will pick his nose then eat it, the recorders are as squeaky as ever and Mary suddenly discovers a penchant for sucking her toes…mid nativity. Rather than giving presents out to fellow workmates I usually make a batch of festive goodies. As it was Xmas and not all my workmates can eat my eccles mince pies, I decided to have a go at making vegan, wheat-free mince pies. Not only the pastry had to be vegan, but also the mincemeat. It just so happened that the brand of cider & rum I used in the suet-free mincemeat I made a few weeks back was also vegan. This was a new departure in baking for me. Before now the only vegan baking I have ever had the courage to attempt is flapjacks. The first task was to find a gluten free flour alternative. Sainsburys came to the rescue when I noticed they sold Dove’s Farm Gluten Free Flour Blend. I was anticipating me having to make my own flour blend. It has a slightly different texture to conventional plain flour, in a kind of way squeakier. The butter replacement was easy, Pure Sunflower Spread. I’ve used it in cooking before with no problems and it is readily available. One tip I picked up while reading around about using gluten free flour is that at first it looks gloopy, resist the urge to add more flour because once it has rested for a bit the flour absorbs the liquid and it magically turns into the right consistency. I have to admit these mince pies were a triumph. I don’t know why I had been so scared about them. The pastry was perfect and my non-vegan friends also really enjoyed them. I’ll certainly be making this pastry again. 1) Rub the spread into the flour until you have the consistency of fine breadcrumbs. Stir in icing sugar, then orange juice and combine until you have a soft dough. Don’t worry if it looks too wet at this stage. 2) Press the dough into a thickened disk shape, cover in clingfilm and chill for at least 30 min. 3) Preheat oven to 180oc. Roll out pastry until it is about 4mm thick. Using a 9cm biscuit cutter, cut out rounds and press gently into a regular cupcake tray. Fill each pie with around 1 dsp of mincemeat. 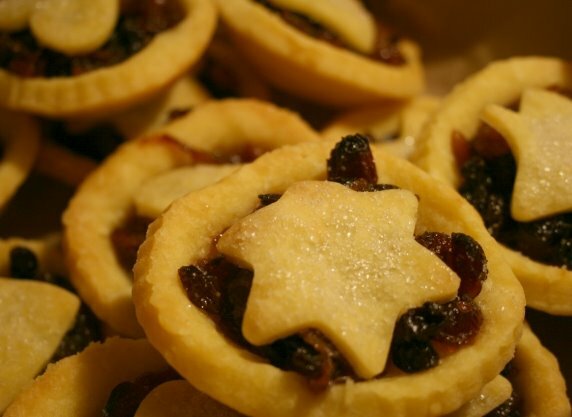 4) Using the remaining pastry cut out shapes and place on top of the mincemeat. Sprinkle with sugar. Bake for 20 min, until pastry is golden. Allow the pies to cool in the tin for a short while before placing on a wire rack. Which brand of flour did you use. I like Dove Farm’s plain flour and find this works well. I’m sorry I haven’t used Xanthum gum before, but it may be worth a try. I used Doves Farm too. I never seem to have much success with GF baking, the things in the shop always work far better, which disappoints me as it’s the other way around with regular cooking!